When the eye is tracing a line, when that line meets another line, greater mental effort is required to decide where it should go next. This is particularly true if the line is visually similar to the line it is meeting (for example being the same hue, width, brightness, sharpness and so on). Effort also increases if it is not clear where a line continues, such as when curves are tangential or a y-junction is met. This effect can appear in simple diagrams and in many physical situations where things overlap. A graphic artist keeps important lines in their diagrams separate and distinct. A photographer uses a picture of a thorn thicket, where small branches go in all directions, to create a sense of confusion. When an eye is following a line, it is often tracing out a shape or following a dynamic direction within an image. When they line meets other lines, the eye/brain has to decide which direction to take, just like when a driver arrives at a road junction. When two lines cross at around a right angle, the eye will still pause briefly, even though the obvious direction is straight across, just like a crossroads. 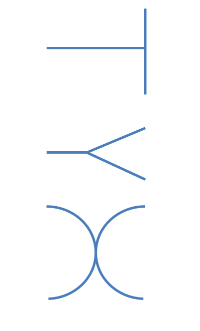 When two lines cross at an angle, there may be difficulty in deciding which is the right continuation path, especially as the choice angle decreases. When a 'T-junction' is met, the eye has to decide whether to go left or right and may well test scan in both directions before deciding which way to go. When a 'Y-junction' is met (arriving from the lower direction), a similar choice to the T-junction is needed. When two shapes are tangential along curves, it can be even harder to distinguish the final route. As indicated by these, there is effort required when alternative paths are available. The effort increases with lack of clarity for the right forward path as the eye has to try each direction to determine the best route. As with other eye tracing, all this happens very quickly, but the tiring out of eye and brain happens nevertheless. The result may be felt as more or less comfort and 'liking' of what is being displayed. If you want to tire a person in order to make them more susceptible to a persuasive message then images with multiple crossing lines may help, especially when this leads to distinct effort required to make sense of what is being shown. Of course you do not want to make them abandon the image, so some moderation may be needed. On the other hand, a relaxing image with few intersections may also make a person feel comfortable, positive and more open to persuasive messages. Which of the two variations you use will depend on your readers, the message and the context.